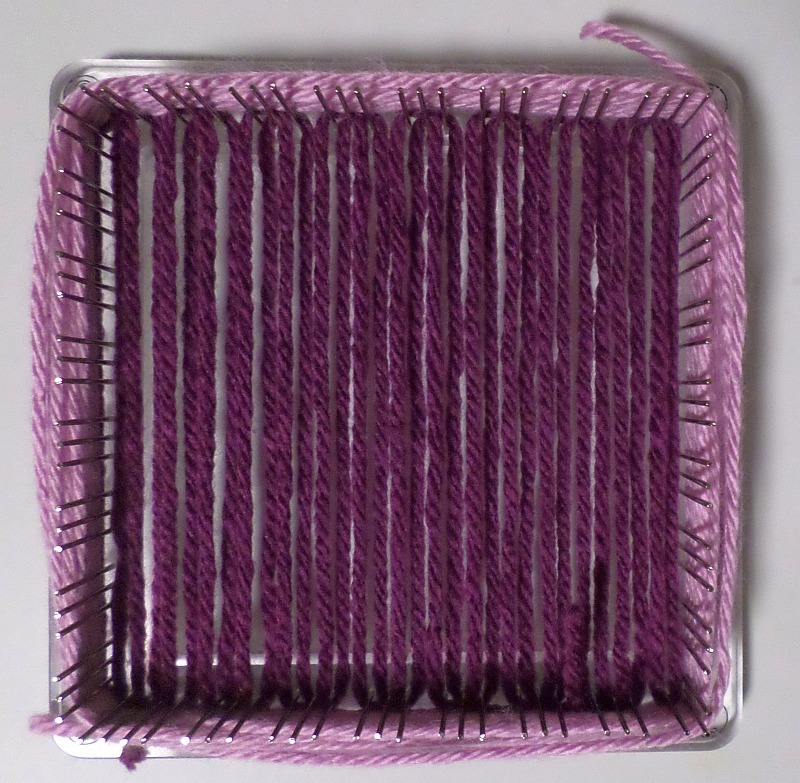 I recommend using TWO weaving needles for this technique. If you only have one you’ll have to unthread and rethread for each row. OR you can use the more mistake-fraught method of weaving L2 completely—starting at Cr3 and working down to Cr2—then weaving L4—from Cr2 up to Cr4—afterward. As mentioned, it tends to be full of mistakes which means a lot of unweaving and reweaving fun. Get another needle. You won’t be sorry. 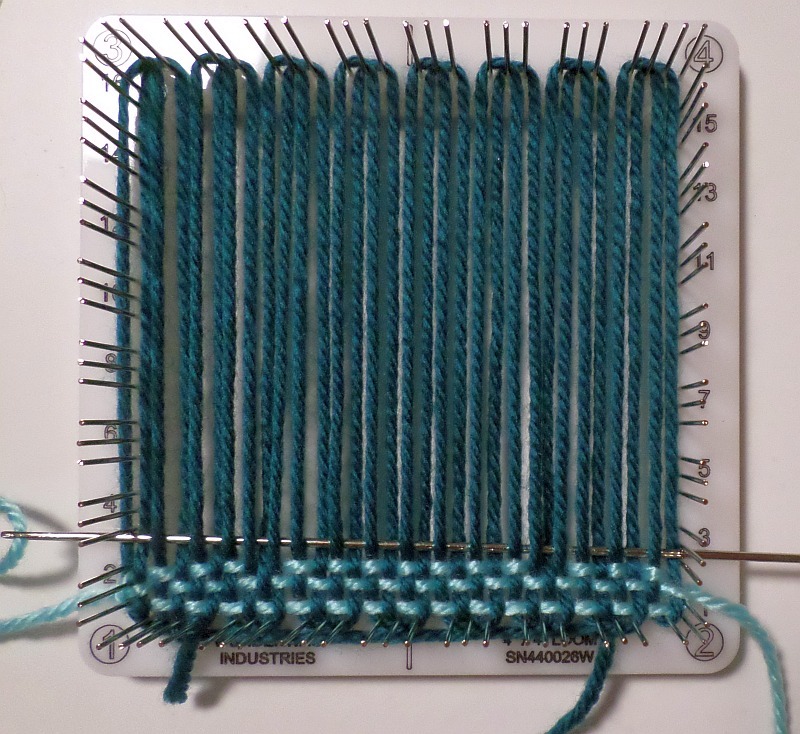 Using COLOR 1, warp the loom in standard two-layer warping, i.e. warp L1, then L3 (see 2LW Warping Basics). 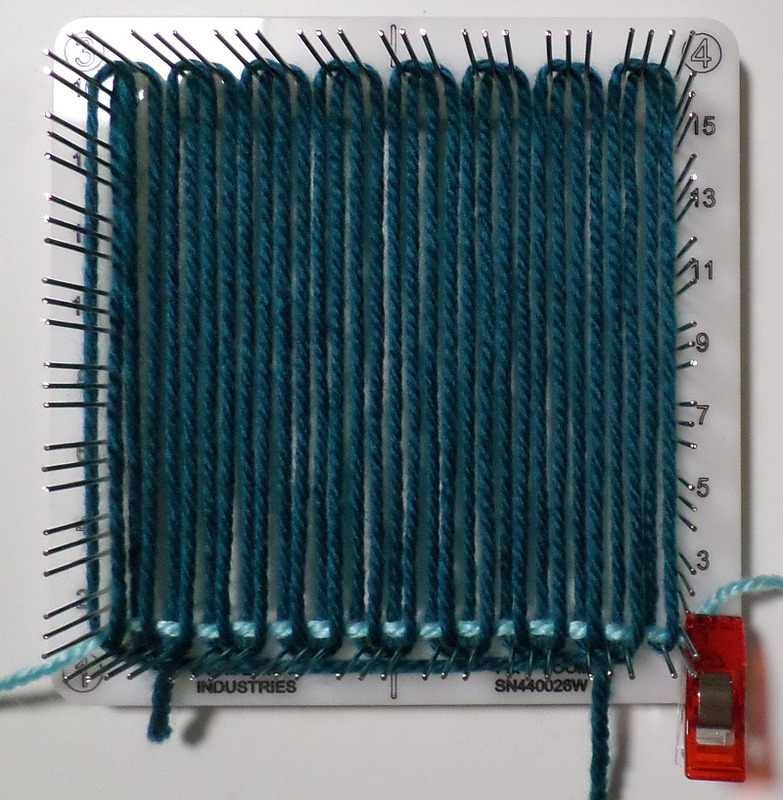 Without securing the weft yarn to the loom, wrap COLOR 2 all the way around the pins 9 1/2 times, cut yarn. 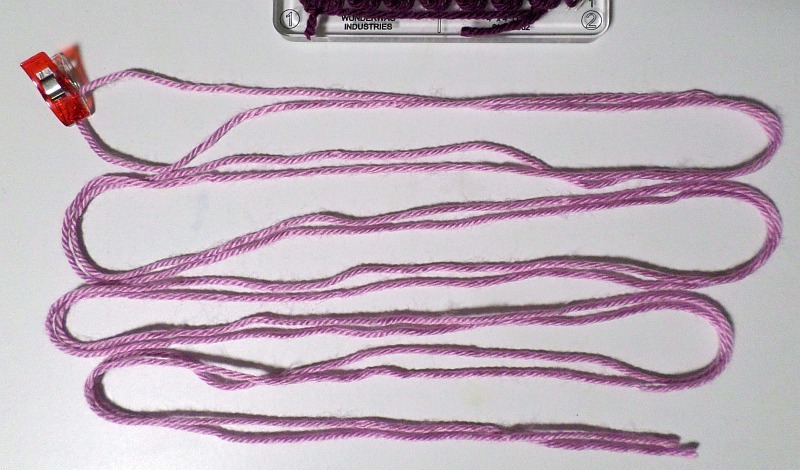 Fold the yarn in half and mark the center point with something that’s easy to remove (such as a clip or scrap yarn). The marking device will only be there a few seconds, so don’t go overboard—you could even pinch it with your fingers. Thread your first needle and weave L4, Row 1 (usually a plain weave row, beginning UNDER). Pull the needle through and stop when your marking device contacts pin #3 at Cr 2. 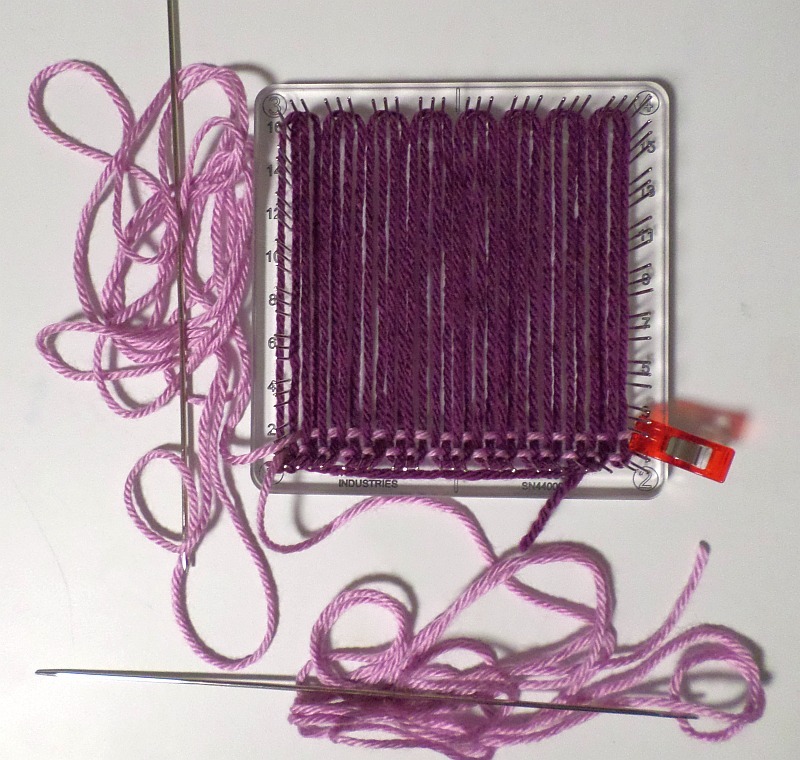 If you have two needles (recommended), thread the opposite end of the yarn through the second needle. Following your pattern instructions (and usually beginning OVER), weave L2, Row 1—AKA R1A (I usually refer to L2 rows by their preceding L4 row number + A so I can count rows using the row numbers on my Wunderwag looms. You can also count individual rows; see chart on Hearts and Diamonds pattern). 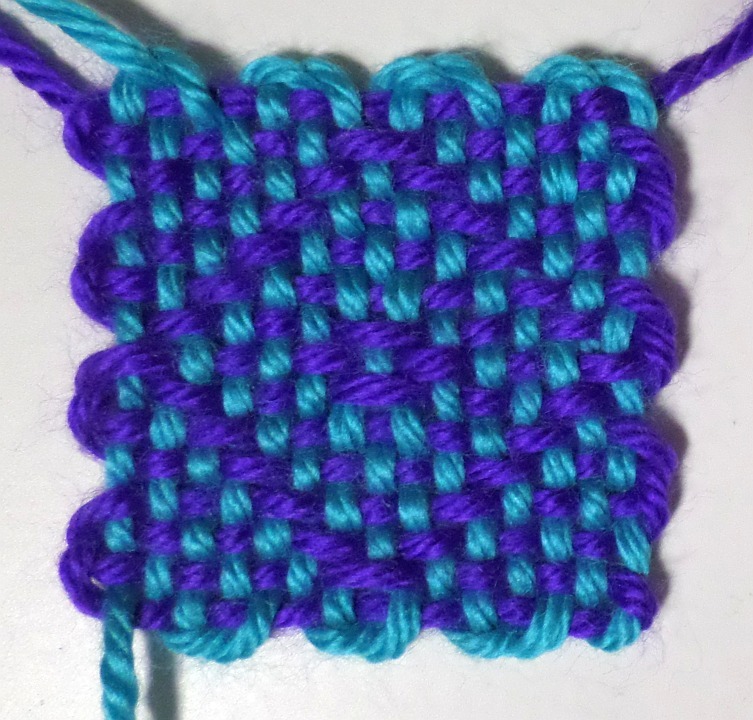 NOTE: In the sample photo below, R1A is also a plain weave row, but in many 2LW patterns this row begins the pattern stitches. Remove the weft yarn center point marker (clip or scrap yarn) and pull the yarn snug around Cr2’s pin #3. Continue weaving following your pattern instructions. Alternate L4 and L2 rows ending with the last L4 row. L4 rows usually begin U; L2 rows usually begin O.
L2 rows enter the weaving through the space between pin groups and exit between pins 1 and 2; L4 rows enter between pins 2 and 3 and exit through the space between pin groups. 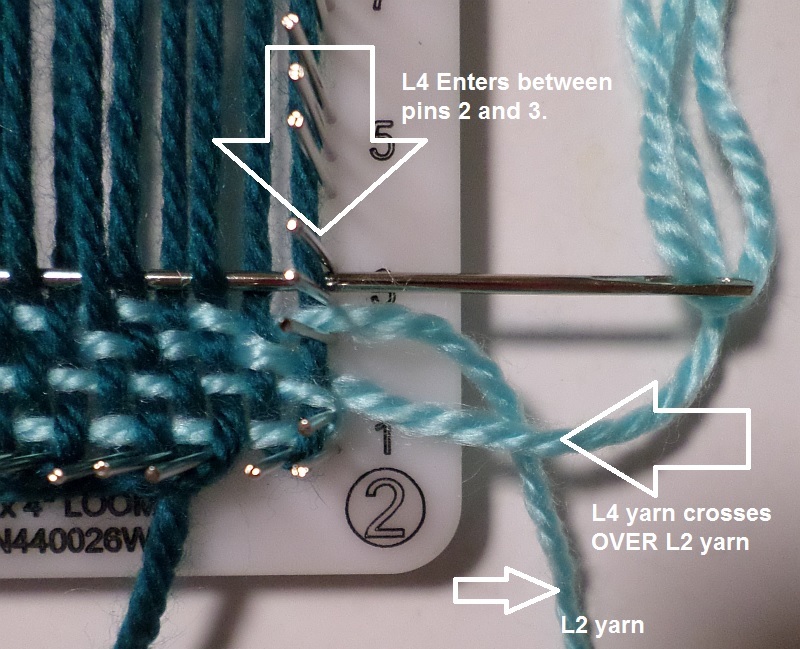 ALWAYS bring L4 yarn over the L2 yarn on the outside of the pins—this forms the scalloped edge. If you get interrupted or confused: when both needles are on one side of the loom, you’re ready for an L4 (or numbered) row; when one needle is on each side of the loom, you’re ready for an L2 (or A) row. Aww, how sweet of you to say so!